PASADENA, Calif. - Approaching its 10th anniversary of leaving Earth, NASA's Mars Exploration Rover Opportunity is on the move again, trekking to a new study area still many weeks away. 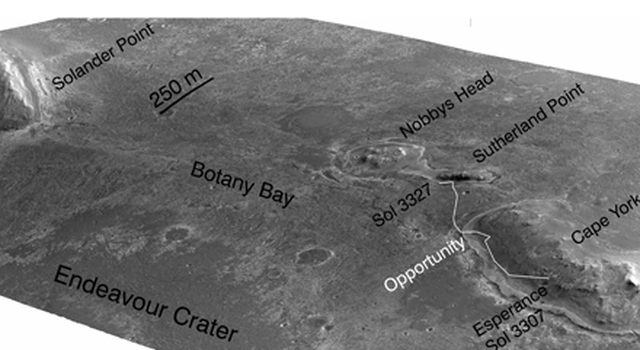 The destination, called "Solander Point," offers Opportunity access to a much taller stack of geological layering than the area where the rover has worked for the past 20 months, called "Cape York." 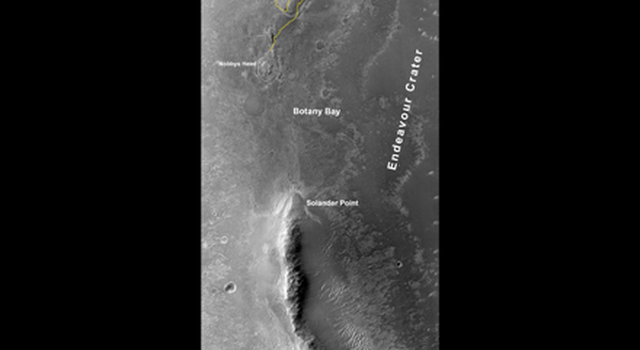 Both areas are raised segments of the western rim of Endeavour Crater, which is about 14 miles (22 kilometers) in diameter. 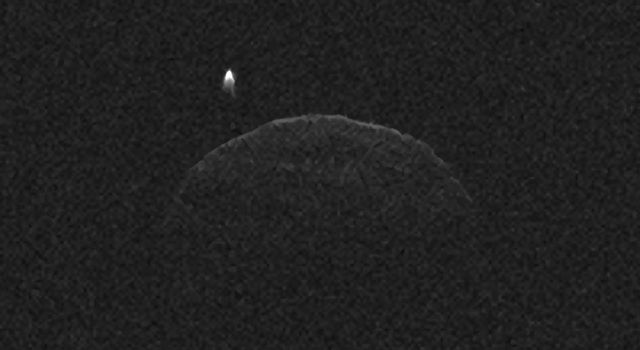 "Getting to Solander Point will be like walking up to a road cut where you see a cross section of the rock layers," said Ray Arvidson of Washington University, St. Louis, deputy principal investigator for the mission. Solander Point also offers plenty of ground that is tilted toward the north, which is favorable for the solar-powered rover to stay active and mobile through the coming Martian southern-hemisphere winter. 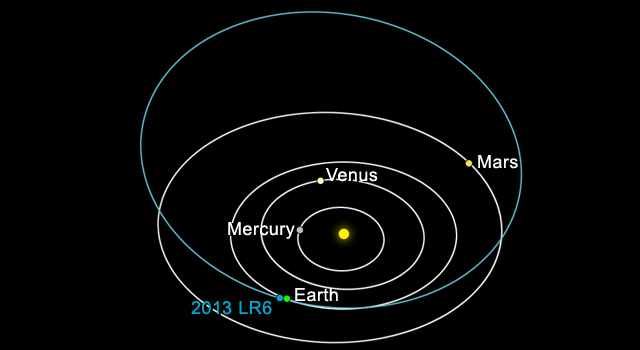 "We're heading to a 15-degree north-facing slope with a goal of getting there well before winter," said John Callas of NASA's Jet Propulsion Laboratory, Pasadena, Calif., project manager for the Mars Exploration Rover Project. 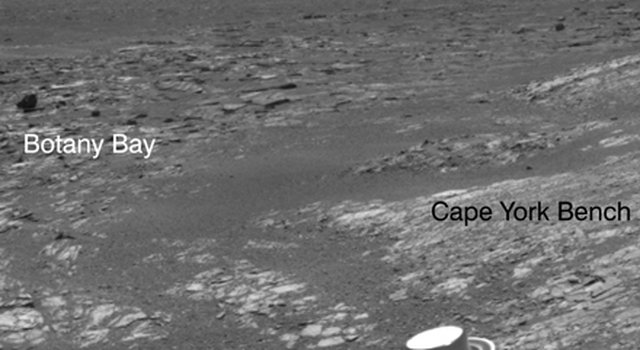 The minimum-sunshine days of this sixth Martian winter for Opportunity will come in February 2014. NASA's Mars Exploration Rover Project launched twin rovers in 2003: Spirit on June 10 and Opportunity on July 7. 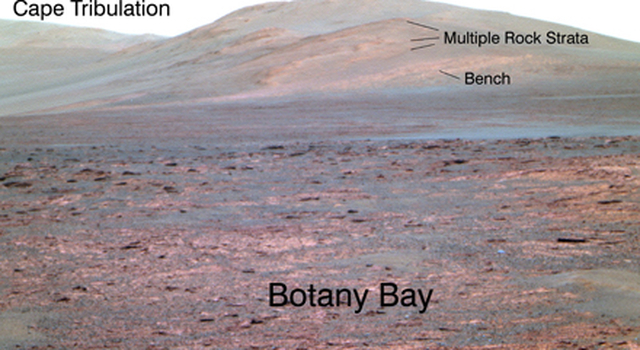 Both rovers landed in January 2004, completed three-month prime missions and began years of bonus, extended missions. 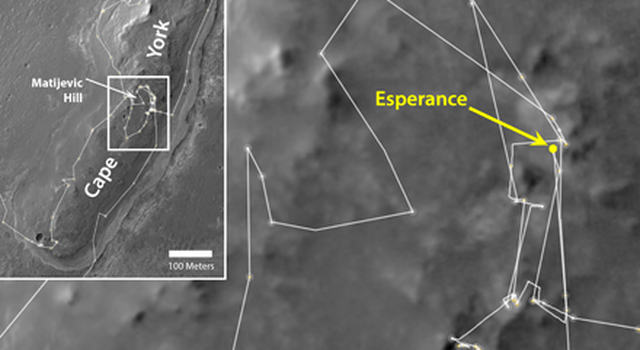 Both found evidence of wet environments on ancient Mars. Spirit ceased operations during its fourth Martian winter, in 2010. Opportunity shows symptoms of aging, such as loss of motion in some joints, but continues to accomplish groundbreaking exploration and science. 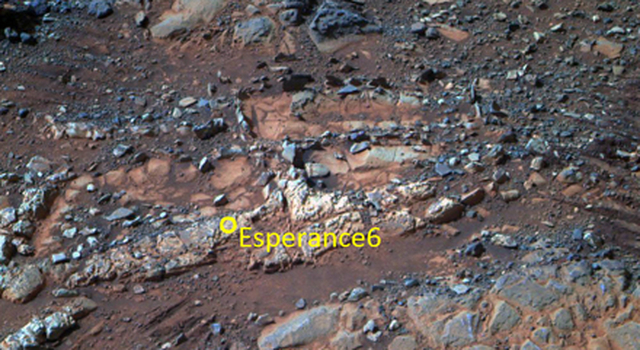 Shortly before leaving Cape York last month, Opportunity used the rock abrasion tool, the alpha particle X-ray spectrometer and the microscopic imager on its robotic arm to examine a rock called "Esperance" and found a combination of elements pointing to clay-mineral composition. 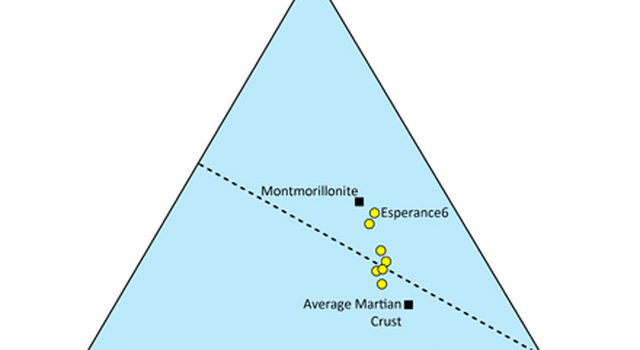 "The Esperance results are some of the most important findings of our entire mission," said Steve Squyres of Cornell University, Ithaca, N.Y., principal investigator for the mission. "The composition tells us about the environmental conditions that altered the minerals. A lot of water moved through this rock." Cape York exposes just a few yards, or meters, of vertical cross-section through geological layering. Solander Point exposes roughly 10 times as much. 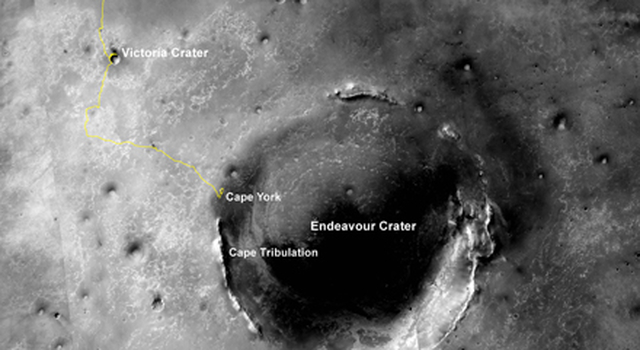 Researchers hope to find evidence about different stages in the history of ancient Martian environments. The rim of Endeavour Crater displays older rocks than what Opportunity examined at Eagle, Endurance, Victoria and Santa Maria craters during the first eight years of the rover's work on Mars.